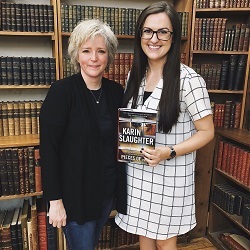 Crime writing powerhouse Karin Slaughter has a brand-new book out this week: PIECES OF HER, a gripping story of a young woman who discovers that the person she thought she knew best in the world - her mom - isn’t at all who she believed her to be. On Monday, I had the incredible opportunity to join Karin in conversation at New York’s legendary Strand Bookstore to discuss PIECES OF HER! Interviewing Karin at the Strand was an absolute highlight of my Crime by the Book years thus far, and I’m so excited to share a recap of the event with you today. In this post, you’ll find a recap of the event, including a video of it (courtesy of the Strand’s YouTube! ), a rundown of where you can catch Karin on tour for her newest book, and more information on PIECES OF HER! Last weekend, I had the fantastic opportunity to attend Bouchercon 2017: Passport to Murder in Toronto, Canada!! This was my first-ever time attending Bouchercon (aka the World Mystery Convention), and it certainly won’t be my last. Bouchercon is a long weekend spent learning from and meeting crime fiction authors from around the world. The weekend was jam-packed with author appearances, panels, interviews, events, and a whole lot more - and I am beyond grateful to have had a chance to experience it! For years now, I’ve been hoping to have a chance to attend Bouchercon, one of the world’s premiere annual crime fiction festivals. This year, I’m thrilled to finally have this chance! Later this week, I’ll be traveling to Toronto (my first-ever trip to Canada!) for Bouchercon 2017: Passport to Murder. In this post, you'll find a rundown of the crime festival, a list of my most-anticipated author appearances and panels, and an overview of the Anthony Awards, which are given out at Bouchercon every year!